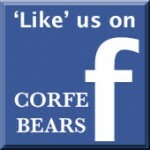 Corfe Bears > Charlie Bears > MINIMO CAPPUCCINO 6"
This adorable little bear is named after a popular coffee classic, which is made with a double espresso shot and steamed milk foam. The new Minimo Cappuccino has been made with a smooth, short-pile mohair on the arms, legs and ears to reflect the smooth, velvet texture of the coffee and the mohair on the head and body is darker, with lots of white tipping to represent the foam. 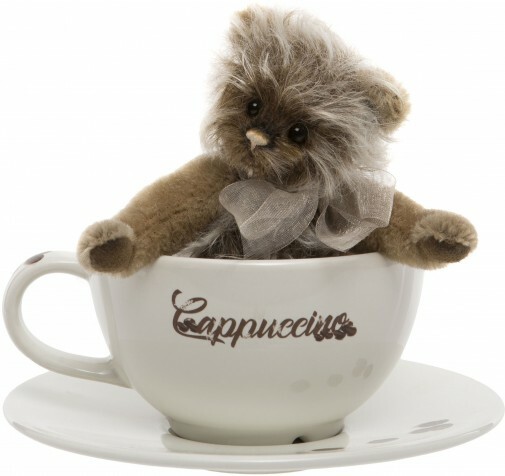 Cappuccino has a small, cream hand-stitched nose and wears an organza bow, with a glass bottle pendant, which is holding some coffee beans..... of course!! A cup and saucer, with Cappuccino written on the front is also included. Is Cappuccino your cup of Coffee? Cappuccino is part of the JUST MY CUP OF COFFEE WITH TWO SUGARS COLLECTION - click here to see the other bears in this collection: LATTE/ESPRESSO/MACCHIATO.